There are so many wonderful abstract surfaces on coral reefs. The coral creatures arrange themselves in colonies of swirls, nodules and sometimes they even look like the human brain. They’re usually named for the shapes that they seem to represent. When I scuba dive, I’m often found perched over a coral head attempting to photograph some small, beautiful invertebrate, but sometimes when I can’t find one, I’ll focus my lens on the coral instead. Elephant ear coral is mostly found clinging to the sides of shear underwater walls and underneath shelves in the reef and many are quite large. These specimens spanned several feet. I just finished reading “Eating Bull” and I found it intriguing. Carrie Rubin does a fantastic job of capturing many of the complex issues around obesity all wrapped into a captivating thriller. I loved Amy’s review and agree wholeheartedly so I’m reblogging here. Have a great week! I know I’ve read a great book when I’m still thinking about it months after I’ve turned the final pages. Carrie Rubin’s Eating Bull is one of those books. It is a tightly crafted thriller, told from the point of view of three characters: Jeremy, an overweight, bullied teen whose favorite friend is food; Sue, the pubic health nurse on a mission to sue to food industry for their reckless manipulation of consumers; and, finally, Darwin, the mystery serial killer who is targeting the obese. It’s a mix of mystery whodunit, horror story, and public health crisis all rolled into one. Many of the characters are suffering some past emotional trauma which is pulled into their eating habits. This backdrop makes these characters seem all the more human and vulnerable. I thought Carrie did a masterful job of telling a horrific story, alongside the complexities of food. Well, the photo challenge is perfect for me this week. 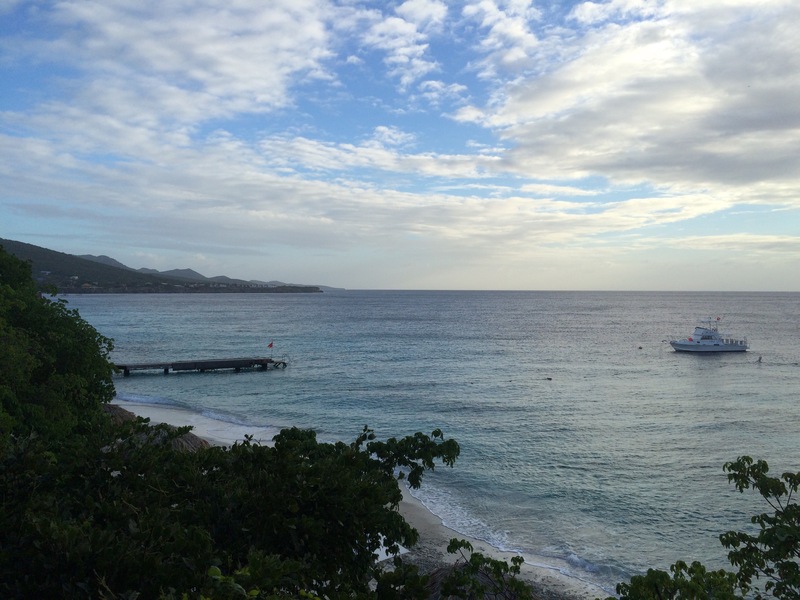 Here’s my view as I finish my coffee prior to my last day of diving in Curaçao (except this was taken a few days ago around sunset). If you’ve followed this blog for a while, you probably know about my scuba diving and underwater photography habit. You might also suspect that I’d pick an underwater shot for my interpretation of “Adventure.” Well, while I don’t alway behave in a predictable manner, this time I’m going with the obvious. Here’s a shot I took last December of a spotted moray eel in Bonaire. To me, it’s quite the adventure to be able to get up close and personal with these magnificent animals. In order to get you in the mood for the Winter Olympics, I’m sharing my selfie from Breckenridge, Colorado where I spent the day skiing Colorado Champagne Powder. And it was a powder day – about a foot of it! 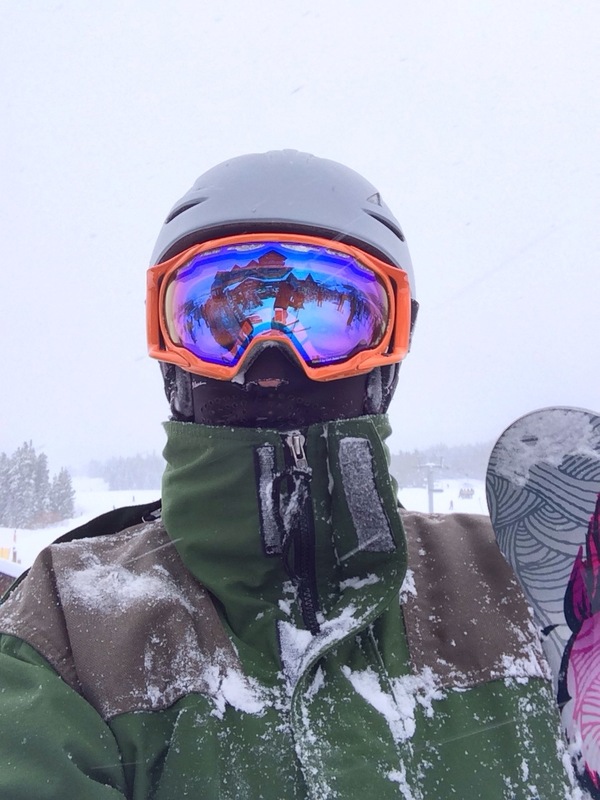 I am smiling under the ski mask, but this is how I spend a cold, snowy day on the slopes bundled up and cruising! Check out my first interview over at We Drink Because We’re Poets! Bastet has written a wonderful post about me, my photography and poetry. What an honor! She had some great questions and I really enjoyed doing this project with her. So come on over and see what you think! Please place carts here! I don’t typically shop at big box stores, but I must admit, I do like Target. And I love their logo and the red balls along the sidewalk in front of the store. In my opinion, they do a good job with their graphics, hence my choice today. I also like how they did the graphic on the sign to actually match the shape of their carts. This shot was taken with the camera in my iPhone 4s using the HDR option.